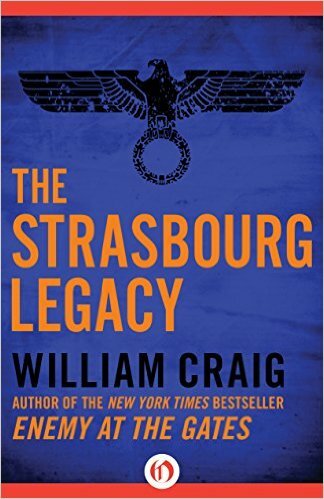 “The Strasbourg Legacy” eBook was published in 2015 (the paper version was originally published in 1975) and authored by William Craig (https://en.wikipedia.org/wiki/William_Craig_(author)). Mr. Craig has published four books. I received a galley of this novel for review through https://www.netgalley.com. I categorize this novel as ‘PG’ because it contains scenes of Violence. The setting of this Thriller novel is the final days of World War II, and then covers about 30 years afterward. As the German SS see the inevitable surrender, they make long range plans to see the Reich rise again. Escape routes are set up and significant wealth is secretly transferred out of Germany and hidden away for future use. In the years after the war, the SS cadre help those friendly to their cause. By the time the bulk of the story takes place, there are many leaders of industry and high placed government officials secretly friendly to the cause. There are many characters in this novel, though the primary one is CIA agent Matt Corcoran. Corcoran leaves a training position at CIA headquarters to investigate the theft of weapons from the US Army. There are a series of other events that seems to point the finger at Soviet espionage, but Corcoran feels there is a deeper plot. He sets out to track down who is behind it all. The SS has bided it’s time and now (the mid 1970’s) it uses its connections, wealth and power to put a series of events in motion that will topple the current German government. Waiting to step in to fill the resulting power vacuum are secret leaders within the SS. I enjoyed the 3+ hours I spent reading this 187 page novel. It reminded me a lot of novels I had read years ago by Helen McInnes and Alistair Maclean. The ‘feel’ of the novel made me believe that it was authored some time ago, and that indeed proved to the be case (1975). It did seem to be a little disorganized at some points, and I think there were perhaps too many characters being followed. Over all, though, I enjoyed the novel. I give this novel a 3.9 (rounded up to a 4) out of 5.